The groundbreaking ceremony for the new Midcity Market occurred on March 20, 2012. Mayor Mitch Landrieu was present to commemorate the new development. As it is with most local development, we are reminded of the travesty of Hurricane Katrina, and how we, collectively as a city, are still in the process of recovery. However, I believe that revitalization is not the appropriate word to use. The area of our study has been prolific, profitable, and in my opinion, vital from the very beginning. The new development will undoubtedly bring jobs and tax dollars to the city as a whole, however, there seems to be little consideration invested in the Midcity Market’s impact on the neighborhood itself. Despite this time of economic hardship, these cookie cutter froyo shops have been materializing within developing cities at an exponential rate. Much like Pinkberry’s neighbor, Whole Foods, businesses are capitalizing on people’s desire and ability to spend more money when they believe that their purchase is healthy. Though frozen yogurt is not quite a health food, it has many less calories than its creamy competitors, and offering fruit toppings alongside the usual syrup and sprinkles reinforces their image. These self-service businesses are ultimately profitable, requiring only enough staff to operate a cash register and tend to the yogurt, while allowing customers to feel empowered in their yogurt selections. Unlike most frozen yogurt establishments of a similar variety, Pinkberry does not allow guests to serve their own yogurt, although you are given free reign on combinations of flavors and toppings. With prices as low as $.20 for an ounce of ice cream combined with deceptively large cups and theoretically ‘endless’ toppings, one snack can come out at around $10. The neon colors, upbeat music, and ultra modern décor cater to a very stylized audience of hipsters and new agers, people who crave the ultra sleek empowerment that Pinkberry provides. I presumed that the best way to understand the impact of the Midcity Market is to understand how the new and old will relate with each other. To do this, I visited the preexisting Pinkberry, located at the corner of Magazine and Joseph St. In accordance with my expectations, the space was very open and bright, with light blue walls and bright green accents. The decorative colors seemed to reflect the beautiful summer’s day that was happening outside of the glass façade. I asked for a modest blend of chocolate and salted caramel yogurt, which seemed like a boring dollop of island in the ocean of my paper bowl. The couple ahead of me was ordering surplus kiwi for their shared bowl, while the school girls behind me seemed to be calculating a way to combine every form of chocolate available. When checking out, the girl who greeted me asked if I had found everything I wanted, which I had, as it was excessively labeled. She was quite friendly, but not exactly personable. I got away only spending four dollars for a sizeable portion of ice cream, though I still felt somewhat guilty for wasting so much packaging on such a small meal. There were not very many people there on a Monday afternoon, however, the area was bustling with the usual sort of people who populate the Magazine street shopping district. There were many men in business attire stopping for lunch and many SUV driving women fighting for a space in the Whole Foods parking garage, amid the sea of young girls boutique shopping. My experience with Angelo Brocato’s was much different. Unlike Pinkberry, there is no parking lot, and so I had to walk a few blocks from my car. It was a Tuesday night and most tables were preoccupied with families. There was a long line blocking the glass case full of treats, and the small space was very loud with many overlapping conversations. The workers bustled around one another, each of them working together to quickly serve each guest. Unlike at Pinkberry, the people here seemed connected to each other. The employees and the customers joked with each other, while families talked at their old wire tables. I ordered the St. Joseph chocolate almond, and the woman ahead of me in line turned around and reaffirmed my choice by giving me a thumbs up and informing me that she too had ordered the chocolate almond. The decorations were antique and quaint, much like a relative’s home. The portrait of Angelo Brocato looked down at everyone from above the counter, yet everyone in the restaurant seemed very focused on the people they were out with rather than the surroundings, much unlike the ultra efficient and impersonal attitude of those at Pinkberry. There were guests of every race and age, from the group of old women in the corner drinking coffee to the young teenagers on what looked like a first date. The difference in seniority, style, and audience are very apparent within these two competing stores. 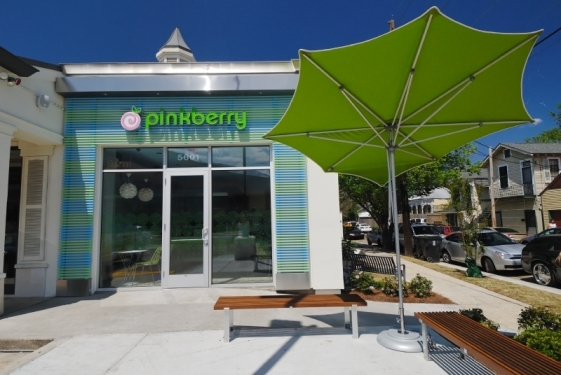 Pinkberry is run with a modern sense of business, primarily focused on profitability and speed, while Angelo Brocato’s retains the slow paced personal experience associated with an aging way of business. The two stores offer similar wares, at relatively similar prices; however, Pinkberry has an entire franchise backing their success, while Brocato’s remains family owned. Brocato’s has always thrived on being the only consistent place to get desert amid so many restaurants, but the introduction of Pinkberry will undoubtedly remove a large fraction of Brocato’s potential business. 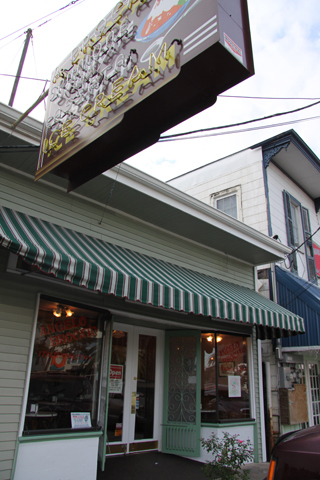 In this way, Brocato’s is the most susceptible to adverse effects of the Midcity Market. Although there are obvious differences in the experience associated with Angelo Brocato’s and Pinkberry Inc., will the draw of nostalgia be able to keep Brocato’s business afloat?